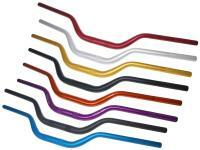 Anodised, oversized motocross or enduro handlebars made of 6061 T6 aluminium with 28.6mm diameter. The left handlebar is knurled to provide a better grip for the rubber handlebar grip. If fitting to older vehicles then and adaptor to convert from 22mm to 28.6mm will be required. Available in different colours, please select from the list below.